In a life filled with families, activities, careers and friends, who has time to cook? 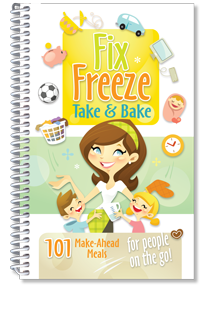 Thawing and reheating is all you need to do when meals are prepared ahead of time and frozen. Delicious cuisine is just minutes away! Each recipe includes detailed freezing, thawing and preparing instructions. Pick from favorites like: Creamy Butternut Squash Soup, Stuffed Bell Peppers, Steak Fajitas, Green Bean Chicken Casserole and Peach Pecan Crisp.